Although this sounds vaguely poetic, it has a specific meaning in the world of information systems. It has particular relevance for large systems. Done well, it makes content management a whole lot easier. I’ve heard this used most often in relation to company intranets – large companies where the intranet must serve a mass of information to thousands or hundreds of thousands of employees. In many large companies intranets grew rather randomly, each business line created their own intranet site, as connectivity improved these were joined together allowing employees to browse from one site to another. But the business retained control of all the information that was available on their site, and employees tended to enter the maze of the the company intranet via their business line home page. Very often this works out well. In companies of this size there are a policies and defined processes on a wide variety of subjects. Many relate to the employee’s own situation; holiday/vacation entitlement, performance review processes or claiming expenses. Others relate to the company’s operations; finance, brand guidelines, recruitment. Often there is a potential legal penalty if the employee does not follow the policy. In an intranet that is a collection of connected sites the policies tend to be copied and republished multiple times. Which means keeping those versions up-to-date and consistent becomes difficult and introduces operational risk. Imagine an employee in a far-flung office following the finance policy she has downloaded from her local intranet, relying on it to conduct business, and finding out later that it’s months out of date. 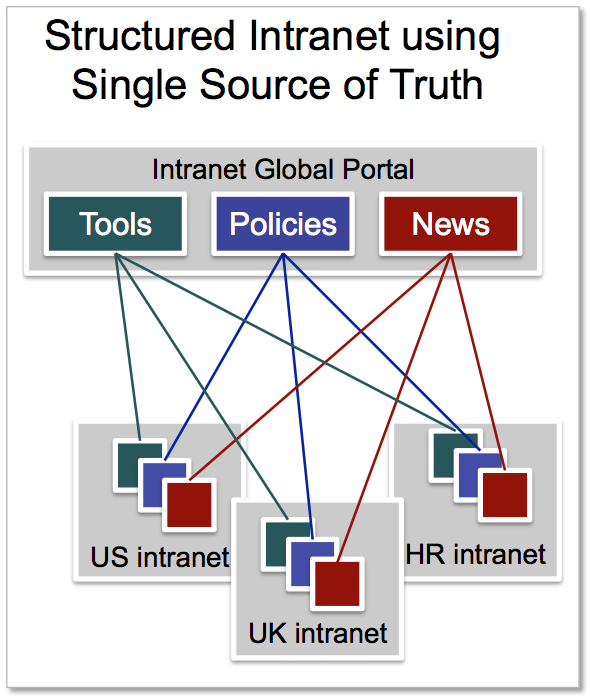 The idea behind the single source of truth relies on improved connectivity between local intranets, and a strong information architecture so that a piece of content – in this case a policy – is published in just one place. It may appear in more than one place across the intranet, but in fact each appearance of it is drawing from the same place; that single source of truth. To deliver this companies must have a connected intranet, a fully thought-out information architecture, a good content managements systems, technical know-how, and governance on the publication and storage of documents. It’s not easy to put this in place in large companies, particularly as intranets are often the “poor cousin” in terms of digital spend. Obviously the content management should become easier and cheaper, but the really big benefit comes from a risk and compliance stand-point. Having a single source of truth means that you know people are using the same policy across the company, this lowers the risk of errors being made, errors that might leave the company financially liable or create a reputation error. It’s a cost avoidance benefit that can be hard to quantify – until such an event occurs in your company.